NAYPYITAW—The government is working hard to come up with a final decision on how to proceed with the controversial Myitsone Dam project, the minister of investment and foreign economic relations said. U Thaung Tun acknowledged that the China-backed project is dogged by major problems and has received nationwide pushback. The minister said the government and a commission studying the project are in very serious discussions and considering all possibilities, including downsizing the dam, relocating it or developing other projects instead. He said the dam project as it was initially conceived under the previous government was “misguided”. 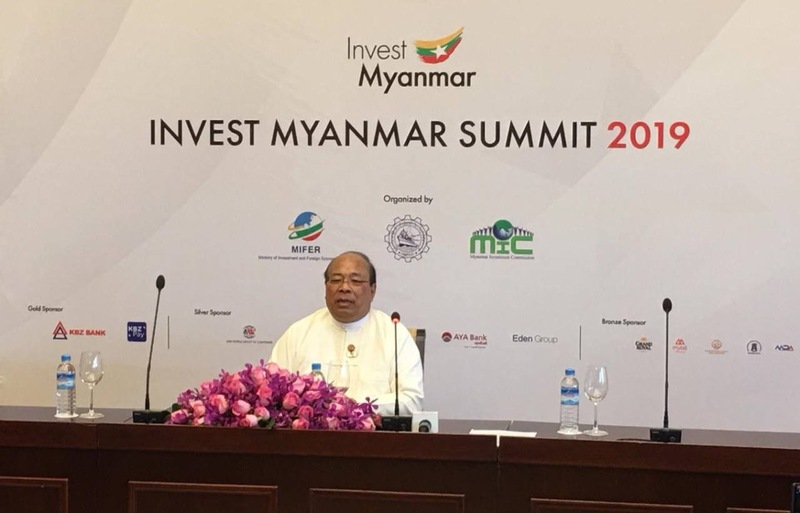 “As we are the government, we are working hard to find a solution,” U Thaung Tun said at a press conference during the Invest Myanmar Summit in Naypyitaw on Tuesday. The proposed US$3.6-billion (approximately 5.48 trillion kyats) Myitsone Dam is one of seven hydropower projects planned for the upper reaches of the Irrawaddy River as well as the Mali and N’Mai rivers, at whose confluence the Irrawaddy begins. Work on the project started in 2009, but then-President Thein Sein suspended it in 2011 amid widespread public concern over the dam’s social and environmental impacts. The project remains in limbo. After the National League for Democracy took power in 2016, the government set up a 20-member commission including the chief minister of Kachin to review the project, including its environmental and social impacts. The commission has produced two reports to date, but the government has yet to release either. U Thaung Tun said the government still wants to find a solution “because we [value] relations with China”. He said a main problem with the Myitsone project is its location on an earthquake fault line. Also, the catchment area would be twice the size of Singapore, which means a lot of villages would be displaced. “That is the issue,” he stressed. He also said local people are concerned the dam will submerge important cultural sites that are sacred to the Kachin people. U Thaung Tun said the public was opposed to the Myitsone project for a variety of religious, cultural and social reasons. “This is the head of the entire river system; this is the lifeblood of Myanmar,” he said. Experts point out that the dam site is important for its biodiversity and environmentalists warn the project would both destroy the natural beauty of the Irrawaddy River and disrupt water flow downstream. Acknowledging the lack of local support for the project, the minister said he had read a newspaper column strongly objecting to the proposed project that morning. In recent weeks, China’s ambassador to Myanmar has strongly pressured Kachin political and religious leaders on the need to restart the Myitsone project. He said it was an important part of China’s ambitious Belt and Road Initiative (BRI) Initiative. State Counselor Daw Aung San Suu Kyi chairs the Myanmar BRI committee. Referring to the previous agreement between a Chinese company and the former military regime, he said, “I believe that if they did enough research, they would find that this dam needs to be reconsidered,” U Thaung Tun said. According to the original project agreement, 90 percent of the electricity generated by the project would go to China. “These are sensitive issues that should have been discussed before the project started,” the minister said. U Thaung Tun cited the example of the Kyaukphyu deep seaport in Rakhine State, a framework agreement for which was inked after several renegotiations with China last year. The project’s estimated cost was reduced from $9.5 billion to $1.3 billion to prevent Myanmar from becoming too indebted to China. He said the government wants to avoid making the same mistake as some other countries, which have found themselves deeply indebted to China after entering into infrastructure-development agreements with Beijing. The government had managed to ensure that Kyaukphyu is a demand-based project, he said. U Thaung Tun said the fate of the Myitsone Dam project was in the hands of the commission, but did not say when a decision would be made.